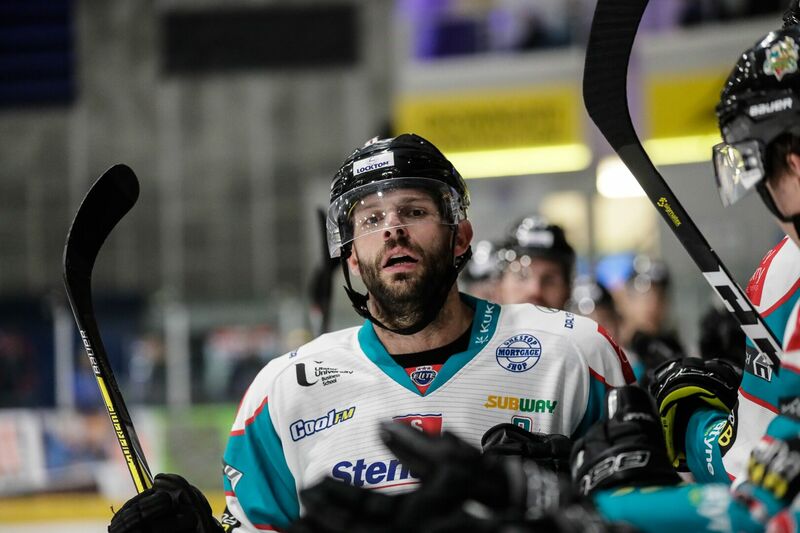 For the third time in three nights, the Belfast Giants took to the ice looking to run the EIHL league table from rock bottom. This time, home comforts were replaced by the notoriously difficult Coventry Skydome- and a Blaze team looking for redemption having been shut out 3-0 by the Nottingham Panthers the night before. Mark Garside was a welcome return to the lineup, only hours after welcoming new son Luke to the world, as the Giants rolled on without the services of Jim Vandermeer, Colin Shields, Matt Towe and Andrew Dickson. The Giants tired legs showed early in the first. An early chance for the Blaze came from Luke Ferrara in front of the crease, following a sloppy turnover behind goal. Fortunately it hit the chest of Tyler Beskorowany. A Giants Power Play (Nicolai Bryhnisveen, 2 for tripping) provided a sure fire chance for Guillaume Gelinas at 10.31, robbed by a great save from close range by Kopriva. A much improved Giants battled on, before Johnathan Ferland took exception to contact from Ben Lake, with both men promptly dropping the gloves at the Coventry bench. Lake probably got the better of Ferland, setting himself up for a Gordie Howe hat-trick and igniting his Coach and team mates. A pair of fives on the board as a result. Shortly afterwards, Guillaume Gelinas took a 2+10 for boarding behind the Belfast goal, a terribly timed penalty which threatened to sap the momentum Belfast had built. As the first period came to a close, Patrick Dwyer broke away on a neutral zone turnover, his buzzer beater shot failing to find twine. The Coventry Blaze were fast out of the traps in the second period as both sides traded chances early on. A Giants Tripping Power Play led to a beautiful top down tip from Dustin Johner in front of goal which somehow stayed out. 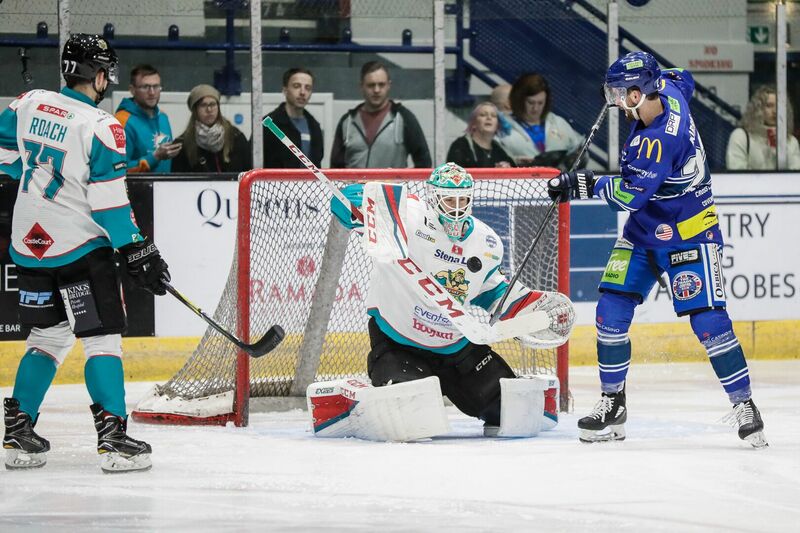 The story of the period for Belfast was Tyler Beskorowany, who utterly stood on his head as a surging Blaze peppered the goal in the Giants’ zone. With Coventry looking sharp, a badly timed Curtis Leonard cross checking penalty at 32.41 led to a vicious clapper in the slot from Nicolai Bryhnisveen to beat Beskorowany down low on the right hand side. The goal also provided Ben Lake with the assist he needed to complete the Gordie Howe. (Cov 2-2 Bel). 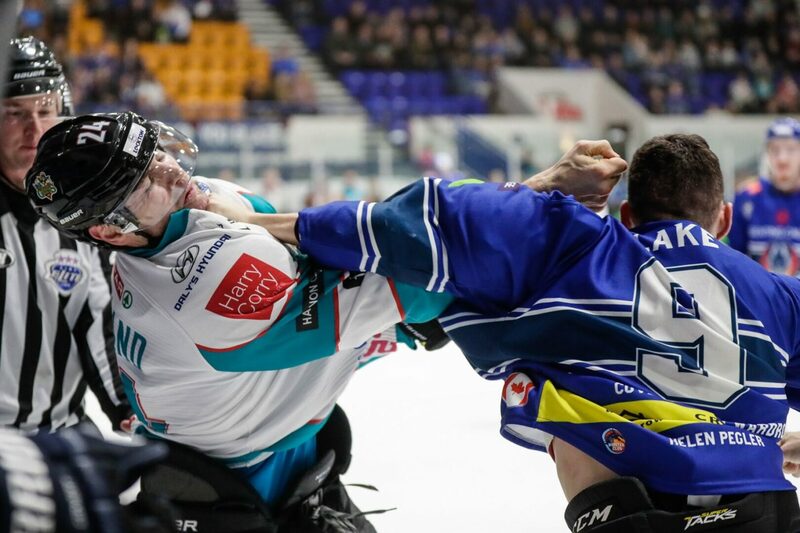 The Belfast Giants continued to threaten. On virtually the next shift, AVFTB Player of the Month Kyle Baun found an open back door unmarked to fire home at 37.11 Baun (Cov 2-4 Bel), ending the second period with a two goal cushion. A comparatively subdued third period began with both Beskorowany and Kopriva flashing the glove, the latter of a pair of outstanding saves at either end coming from a Kyle Baun wrister from the mid-slot. The Blaze lacked the pressure or physicality they needed to get back into the game as the clock passed 40 minutes. 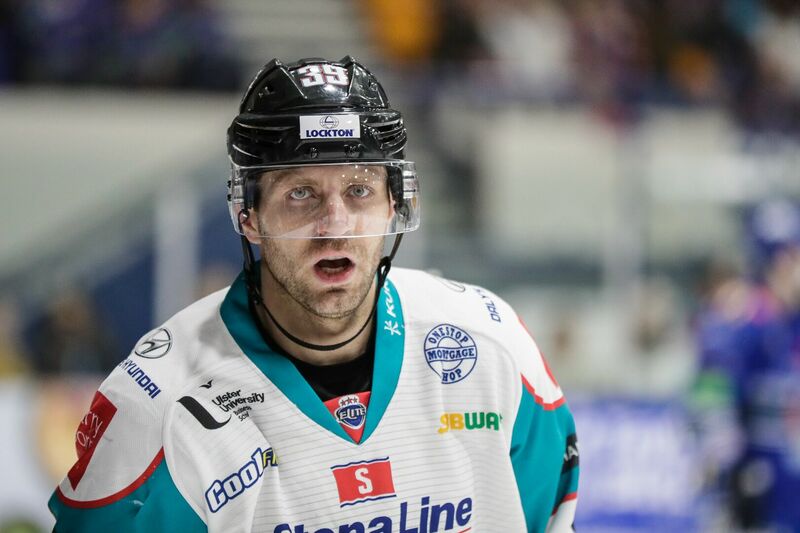 As Head Coach Adam Keefe had stressed in the days leading up to the game, the Belfast Giants continued to do the simple things well; bar one mid period moment of madness where defensive error led to a goal mouth scramble with Beskorowany on the floor. It seemed the Blaze seemingly also lacked that little bit of puck luck needed to re-enter the game. A very poorly timed Francis Beauvillier cross checking penalty provided a period of concern for Belfast- with Coventry taking a timeout mid power play and pulling their goaltender. Bar a heart stopping moment where Tyler Beskorowany utterly robbed Luke Ferrara from the floor, the Giants successfully killed the penalty and ran out the clock to complete the six point weekend.